Coming off a tough loss to the fifth-ranked Louisville Cardinals, the Lady Blue Raiders(1-2) would look to bounce back Saturday night. 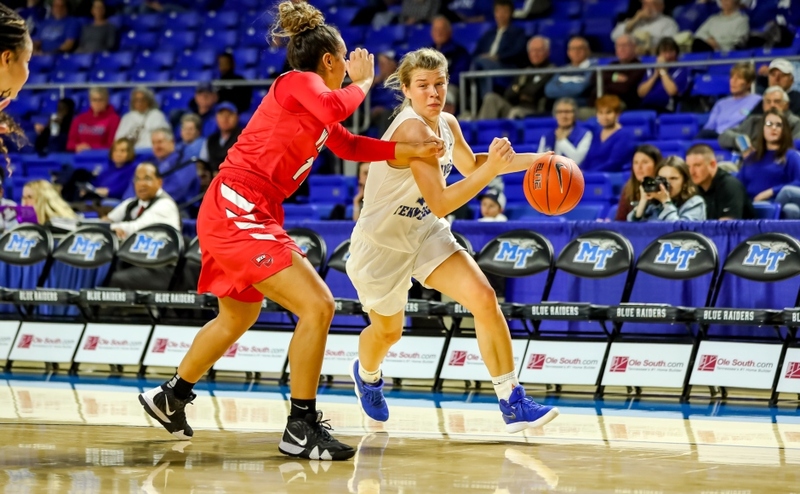 The Blue Raiders traveled to Cookeville (1-3) to take on the Tennessee Tech Eagles in a game they would ultimately win by double figures, 73-62, to nab their first win of the young season. The first quarter was highlighted by a slow shooting start for the Raiders as they shot just 38% from the field. Things were quite opposite for the Eagles as they got off to a hot start shooting 50% from the field in the first quarter. The second quarter was a different story. 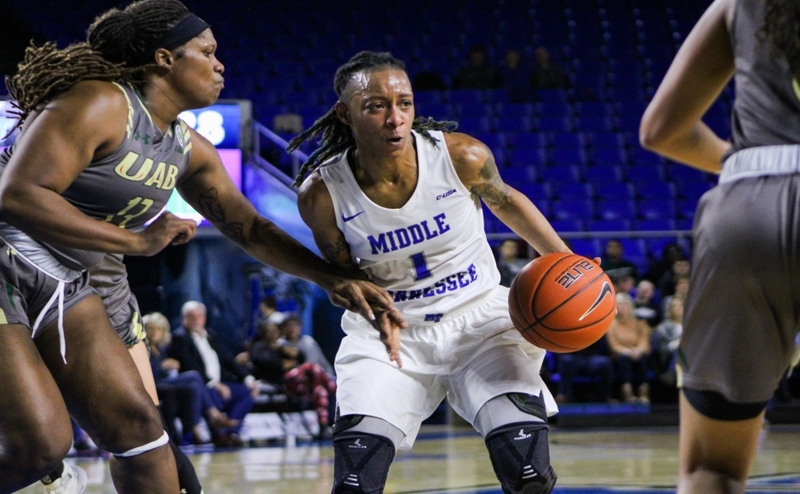 Middle Tennessee’s defense seemed to clamp down as the Lady Eagles shot 36% from the field. The Blue Raiders offense seemed to work more efficiently as they would go on to shoot 50% for the quarter. Although the game was competitive, Middle Tennessee took a six point lead into the break, leading 33-27. 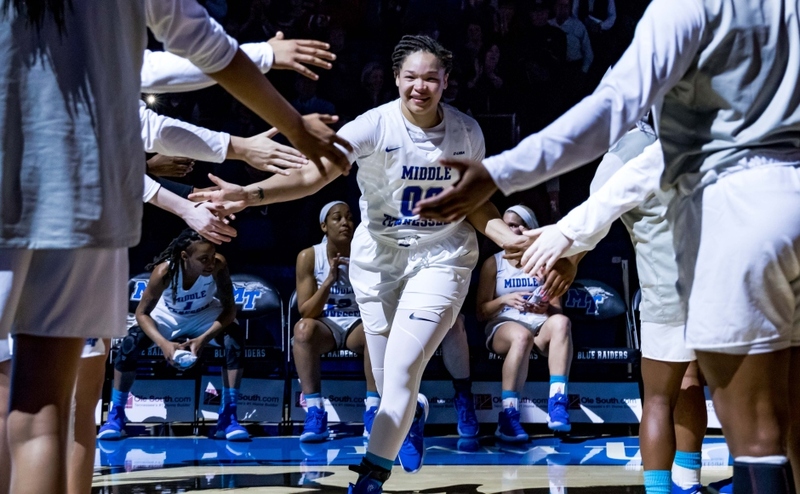 The third quarter turned out to be a high scoring frame in which Middle Tennessee won 19-18. The Lady Raiders would take a 52-45 lead into the final stanza. “We challenged our post players and asked them to lead us,” Head Coach Rick Insell said. 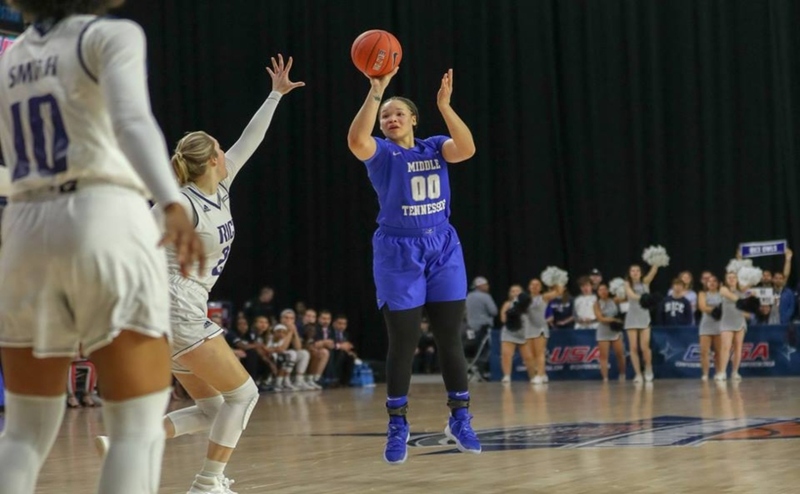 The Blue Raiders responded as their posts combined for a total of 42 points and outscored the Golden Eagles 42-30 in the paint. Although the post play was solid, impressive perimeter shooting from the Blue Raiders helped them secure a win. Abbey Sissom went 3-3 in the final frame from behind the arc, scoring 12 of her 16 points in the fourth quarter. Jess Louro also knocked down her only trey of the game in the quarter. The two combined for all of Middle Tennessee’s four three pointers in the final quarter. The Lady Raiders used solid shooting from the field to help secure the win. They went on to shoot 51% from the field for the game. Good free-throw shooting helped close out the Eagles as MTSU shot 74% from the line. The Lady Raiders used balanced scoring to secure the road win as Alex Johnson and Abbey Sissom poured in 16 points each. Gabby Lyon added 12 with a game-high eight rebounds while Ty Petty and Rebecca Reuter each tossed in 12 points on the night as well. Middle Tennessee will return to action Wednesday Nov. 30 when they take on Ohio (2-0) at home.